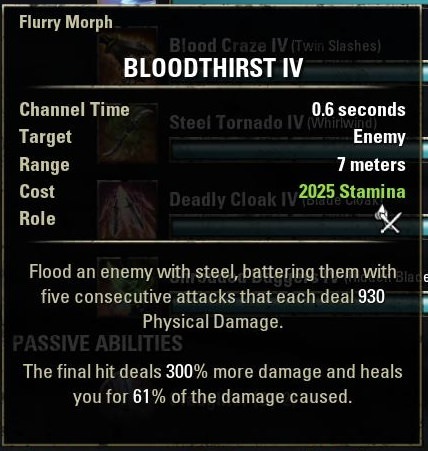 Flurry and morphs 300% final hit not scaling correctly from percent amps. base hit was 656 and the final hit was 2625 and 2625/656 is 4.00 this is the correct way the game ought to scale the skill, as was recently pointed out to me by @glavius. and then I parsed again. this is where things got a little tricky, base damage went up and so did the final hit but as you can see, base is 741 and the final blow is 2709 and 2709/741 is 3.65, not 4, like with no other percent amps. but 2709/656 is 4.129. so the game is taking the 300% and adding it to the 13% from mighty, multiplying by the base and then adding the base damage back in, like this (656*313%)+656. this seem to not be the way that would be intended. another parse, i added 20% into thaumaturge. 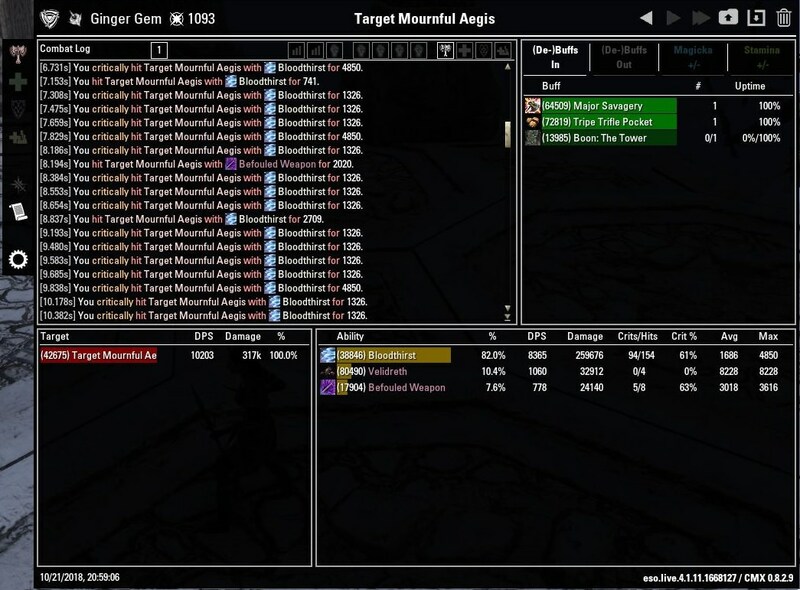 again, the base damage and the tooltip went up, by the correct amount, 872 in the parse. But the final blow is 2841 and 2841/872 is 3.25, Again not 4. But 2841/656 is 4.33. and it is additive on the last hit. I believe that the calculation looks like this, (656*333%)+656. The calculation ought to look like this, in my opinion, (872*300%)+872, taking the tool tip number and simply multiplying the 300% and then adding it back in. this would bring the damage up to 3488. 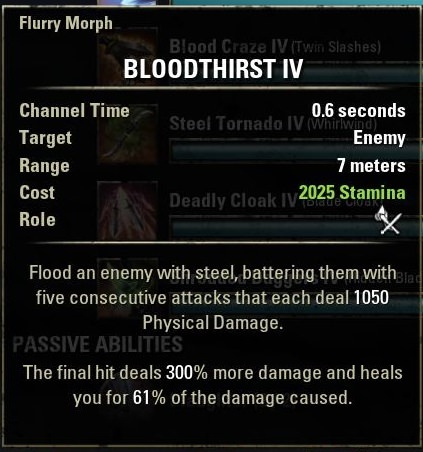 Without the math working like this, the skill is around 10% weaker then it seems it ought to be, at my champion points and would only get weaker the more you add percent amps to it. This is very counterintuitive. The final attack does scale correctly without any damage bonus. However with CP, Minor Berserk, etc is applied individually to the ticks and does not double dip. Hence, while it might look that the scaling is wrong, it is actually correct. If the final attack would just take the base tick value and multiply with 4x damage, it will essentially double-dip from any bonuses. But, apart from execute, every skill bonus is calculated additively. I have shown this is is false. Look at my results. There would be no double dipping if the skill simply took the tool tip, multiplied by 300% and then added the tool tip back it. But it does not do this. 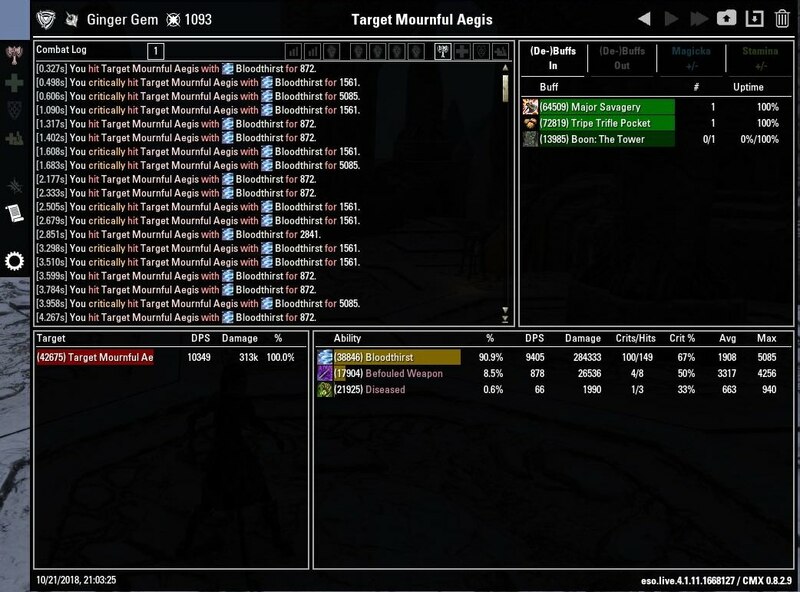 It takes all the percentage amps, adds them to the 300%, multiplys the base damage, that is the base damage of the skill before any percentage amps are added to it, then adds the base damage back in. So the calculation looks like what I said, (x*300%)+x. Not like you are trying to say, x*400%. The percentage amps are added to the 300% but not the "+x" part. This is a problem, you are losing damage in this part. The first four ticks are fine. It is the last hit that is not scaling correct, or at least scaling in the way it seems it ought to. Still scaling weird with the new patch. With the new pts, the scaling is still working as described in the op. Again, the scaling of the final hit with the 5.0.0 pts patch is bonkers. 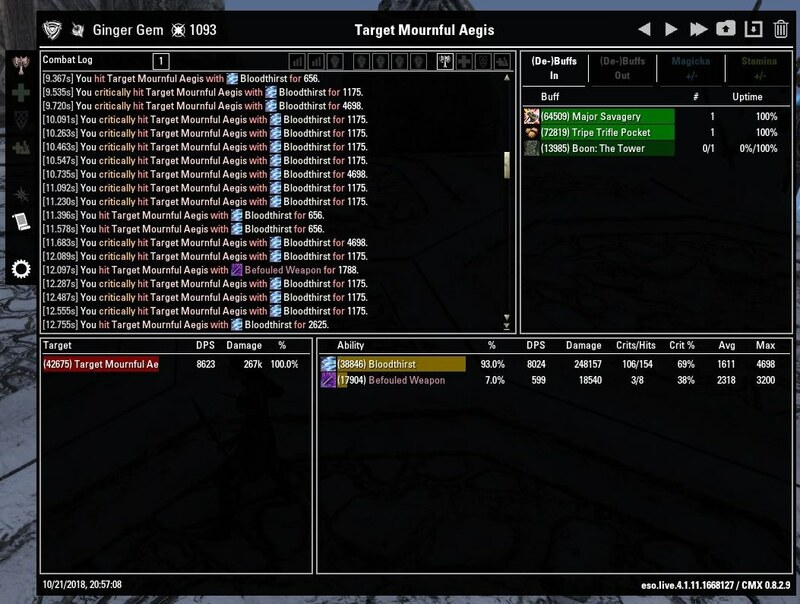 I would like to add that puncturing strikes and morphs have a similar scaling mechanic to the 300% last hit of flurry and morphs, applied to the closest mob to you, they take 160% more damage then the rest of the mobs in the cone. But this 160% is correctly multiplicative with all other percentage amps. 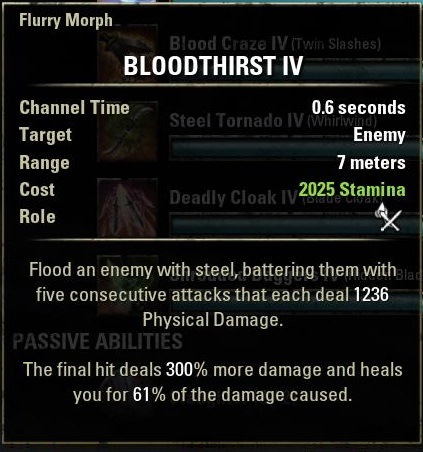 Would flurry proc ravager in the same nature as say a Templars jabs? Just wondering thanks. Not really the topic of this thread but if I had my way, both jabs and flurry would not proc that set and the set would specifically state direct melee damage. Same with Selenes, I would not have jabs or flurry proc it, as they are damage over time melee damage. Right now, as far as I know, jabs procs both Selenes and ravager but flurry does not.